Abstract. 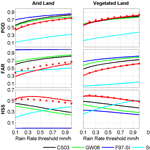 A novel algorithm for the detection of precipitation is described and tested. The algorithm is applicable to any modern passive microwave radiometer on board polar orbiting satellites independent of the observation geometry and channel frequency assortment. The algorithm is based on the application of canonical correlation analysis and on the definition of a threshold to be applied to the resulting linear combination of the brightness temperatures in all available channels. The algorithm has been developed using a 2-year data set of co-located Special Sensor Microwave Imager/Sounder (SSMIS) and Tropical Rainfall Measuring Mission precipitation radar (TRMM-PR) measurements and Advanced Microwave Sounding Unit (AMSU) Microwave Humidity Sounder and TRMM-PR measurements. This data set was partitioned into four classes depending on the background surface emissivity (vegetated land, arid land, ocean, and coast) with the same procedure applied for each surface class. In this paper we describe the procedure and evaluate the results in comparison with many well-known algorithms for the detection of precipitation. 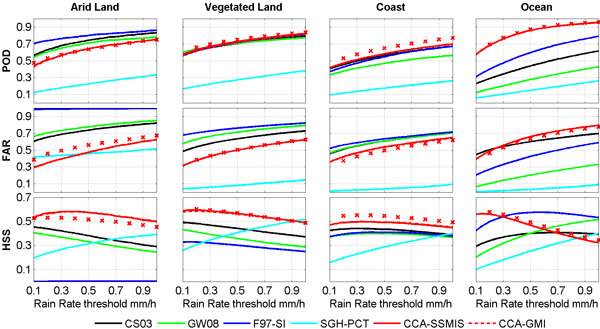 The algorithm shows a small rate of false alarms and superior detection capability; it can efficiently detect (probability of detection between 0.55 and 0.71) minimum rain rate varying from 0.14 mm h-1 (AMSU over ocean) to 0.41 (SSMIS over coast) with the remarkable result of 0.25 mm h-1 over arid land surfaces. How to cite: Casella, D., Panegrossi, G., Sanò, P., Milani, L., Petracca, M., and Dietrich, S.: A novel algorithm for detection of precipitation in tropical regions using PMW radiometers, Atmos. Meas. Tech., 8, 1217-1232, https://doi.org/10.5194/amt-8-1217-2015, 2015. The CCA algorithm is applicable to any modern passive microwave radiometer on board polar orbiting satellites; it has been developed using a data set of co-located SSMIS and TRMM-PR measurements and AMSU-MHS and TRMM-PR measurements. The algorithm shows a small rate of false alarms and superior detection capability and can efficiently detect (POD between 0.55 and 0.71) minimum rain rate varying from 0.14 mm/h (AMSU over ocean) to 0.41 (SSMIS over coast).